Our preliminary screen yielded 31 adult viable spine mutants that bred true in the next generation. We will now uncover the genetic underpinnings of scoliosis in these zebrafish mutants. Aim 1: Define genes disrupted in scoliotic zebrafish mutants using WGS. Aim 2: Validate candidate loci associated in human AIS patients using genome-editing approaches (CRISPR-CAS9) in zebrafish. Aim 3: Identify the cellular and molecular etiology of spine disorder in individual mutant strains. revealed several hallmarks of AIS, including postnatal onset of scoliosis without malformations of vertebral units. 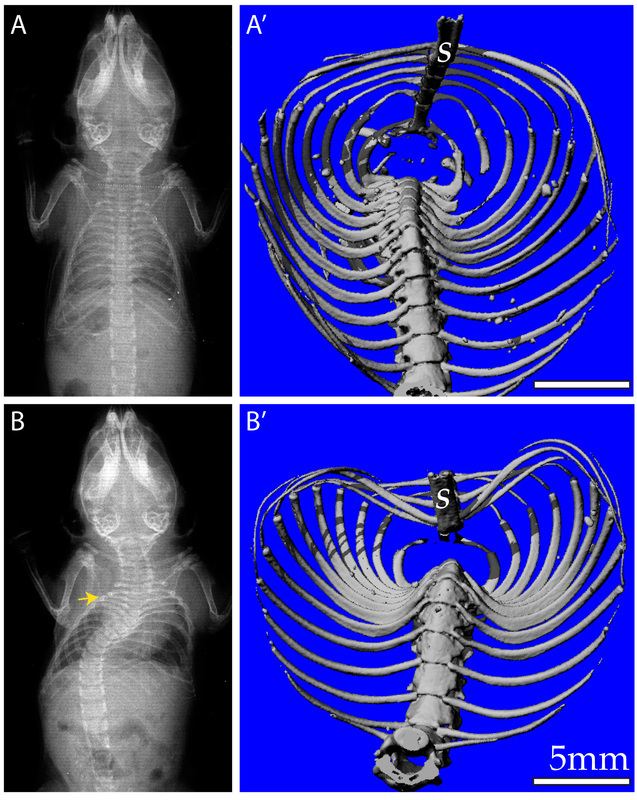 The mutants also displayed a dorsal-ward deflection of the sternum akin to human PE. At the cellular level, these defects were accompanied by failure of midline fusion within the developing annulus fibrosis of the intervertebral discs and increased apoptosis of chondrocytes in the ribs and vertebrae. Molecularly, we found that loss of Gpr126 upregulated the expression of Gal3st4, a gene implicated in human PE, encoding Galactose-3-O-sulfotransferase 4. Together, these data uncover Gpr126 as a genetic cause for the pathogenesis of AIS and PE in a mouse model. Aim 1: Determine the precise cellular and temporal role of Gpr126 function for spine development and homeostasis. Aim 2: Define molecular mechanisms of Gpr126 in musculoskeletal tissues. Aim 3: Determine the nature of transcriptional changes within regions of the intervertebral disc during the natural history of AIS.